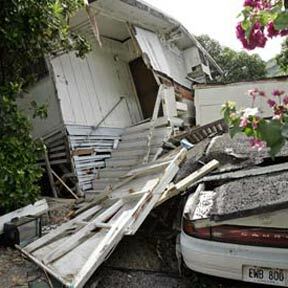 The house at 806 Ekoa Place in Aina Haina, shown here yesterday, collapsed during heavy rains Monday night. At right, the carport also collapsed on the car inside. No injuries were reported. Oahu's skyrocketing home prices have finally spread to all ends of the island with a record $2.1 million sale in Maili that could put additional pressure on buyers. A civil rights group has again filed suit against the state, accusing officials of failing to correct problems at a prison facility for youths.